Reno at the 2016 Cannes Film Festival. Reno was born Juan Moreno y Herrera-Jiménez in Casablanca, Morocco. His parents were Spanish, natives of Sanlúcar de Barrameda and Jerez de la Frontera in Andalucia, and had moved to North Africa to find work and escape Francoist Spain. He has a younger sister named María Teresa ("Maite"), and the children were raised Catholic. Their father was a linotypist. Their mother died when he was a teenager. He learned Spanish from his parents, and Arabic and French growing up in Morocco. At the age of 17, he moved to France, where he studied acting in the Cours Simon School of Drama. When he moved to France, he served in the French Army, which was mandatory after his family gained its French citizenship. After he started to get acting jobs in France, Juan adopted the French version of his name, Jean, and shortened his surname to Reno. Due to his large frame (1.88 m or 6 ft 2 in), Reno was called on to play "heavies" in his early career. He later appeared in romantic comedies and action films. He began his film career in France, appearing in many films by director Luc Besson, including his early Le dernier combat (1985). The two have continued to work together, collaborating in films produced, written, or directed by Besson. Of their joint work, those that have achieved the most critical and commercial success include: Nikita (1990), and the English-language films The Big Blue (1988) and Léon: The Professional (1994). Reno did the voice-over for Mufasa in the French-language version of The Lion King, a role originally performed in English by James Earl Jones. Reno has starred in such high-profile American films as French Kiss (1995) with Meg Ryan and Kevin Kline, Mission: Impossible (1996) with Tom Cruise, Ronin (1998) with Robert De Niro, and Godzilla (1998) with Matthew Broderick. Reno turned down the role of Agent Smith in The Matrix. He also acted in French productions: Les Visiteurs (1993) (which was remade in English as Just Visiting in 2001); The Crimson Rivers (2000), and Jet Lag (Décalage horaire) by Danièle Thompson (2002), which was also a box-office success in France. In 2006, Reno had a prominent role in The Pink Panther 2006 remake and its sequel The Pink Panther 2, playing Gilbert Ponton, opposite Steve Martin as Inspector Clouseau. He portrayed Captain Bezu Fache in the Ron Howard film The Da Vinci Code. Among his most successful films are Les Visiteurs and L'Enquète corse. In other media, Reno was involved in the production of the third installment in the popular Capcom series Onimusha (Onimusha 3: Demon Siege), lending his likeness to the protagonist Jacques Blanc, as well as providing the voice for the character's French dialogue. In advertising work, Reno has appeared in American television commercials for UPS and portrayed Doraemon in a series of Toyota ads in Japan, as part of the "ReBorn" campaign. Reno first married a woman named Geneviève, with whom he had a daughter, Sandra (born 1978), and a son, Mickael (born 1980). Reno's second wife was Nathalie Dyszkiewicz, a Polish model, with whom he had a son, Tom (born 10 January 1996), and a daughter, Serena (born 28 June 1998). On 29 July 2006, Reno married for the third time, to British model and actress of Polish descent, Zofia Borucka, 35, at the Les Baux-de-Provence city hall. The presidential candidate Nicolas Sarkozy served as his best man (Reno endorsed Sarkozy for the 2007 French presidential election). Zofia and Reno welcomed their first son Cielo born in July 2009 in New York City. Their second son Dean was born in September 2011. Reno maintains homes in Paris, Malaysia and New York City. ^ "Jean Reno - scheda attore". Film.it (in Italian). Retrieved 30 April 2010. ^ a b Dawson, Angela (10 May 2006). "Jean Reno cracks the `Code'". AllBusiness.com. Nielsen Business Media, Inc. Archived from the original on 9 December 2011. Retrieved 30 April 2010. ^ Jamieson, Teddy (30 August 2010). "Jean Reno on 22 Bullets". Herald Scotland. Herald & Times Group. Archived from the original on 5 September 2010. Retrieved 30 August 2010. ^ "Jean Reno Biography". Yahoo! Movies. Yahoo. Archived from the original on 22 May 2011. Retrieved 30 April 2010. ^ Loo, Egan (18 November 2011). "Film star Jean Reno's live-action Doraemon ad streamed". Anime News Network. Retrieved 9 December 2018. 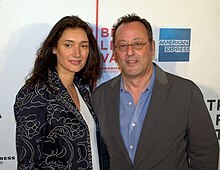 ^ "Da Vinci Code Actor Jean Reno Weds". People.com. Time Inc. July 30, 2006. Archived from the original on 27 August 2006. Retrieved June 17, 2016. ^ Melillo, Wendy (4 June 2007). "What the French Taught Us". Ad Week. Nielsen Business Media, Inc. Archived from the original on November 28, 2007. Retrieved 9 December 2018. ^ "Les acteurs qui soutiennent des candidats : Jean Reno - Nicolas Sarkozy". Linternaute (in French). 2007. Archived from the original on 4 October 2010. Retrieved 30 April 2010. 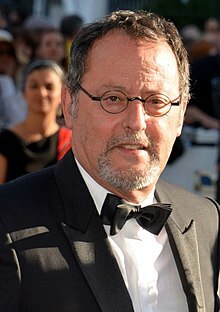 Wikimedia Commons has media related to Jean Reno.